You don't have to be perfect to make progress. 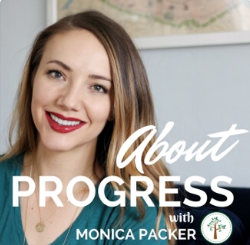 I think you consciously understand this – I mean we all know #progressnotperfection. But even so, many many people end up falling into the “all or nothing” mentality where if they can't be perfect, why even try? Can't track the restaurant meal? Might as well order whatever. Can't get to the gym for your hour workout? Might as well just skip it today. Hungry and out of macros for the day? Might as well eat the whole house. Here's something I want you to internalize: to make progress all you need to do is make a better choice that you would have before. ✅ If you normally eat a whole sleeve of Oreos when you are stressed, eating only 5 is better. ✅ If you normally get 5 hours of sleep, getting 6 is better. ✅ If you normally eat on the go, then eating a meal slowly and mindfully is progress. The point is, perfection is not required to make progress. And the more you can really internalize that, the more successful you are going to be. I have my clients use the “good, better, best” module. If you can't make the “best” decision, default to making a “good” or “better” choice rather than throwing your hands in the air and giving up. So take advantage of all the progress you could be making by focusing on the “goods” and “betters” in your life rather than beating yourself up for not always hitting “best”. PS. If you aren't yet following me on Instagram come hang out with me. I post content on my feed and in my stories to inspire, educate, and help you hit your fitness goals. Just go here and then click the follow button. As my daughter makes her way towards the teenage years, I've really been reflecting on the values I want her to learn when it comes to health and fitness. My kids know what I do, they see me set and work for goals, and they are hopefully learning that health and fitness is WAY more than what you look like. 1) Heathy eating should always include treats. My mom fed us plenty of vegetables and lean proteins growing up. I even remember the time she tried to make a fat-free pie crust. (Spoiler alert: it was a rubbery, inedible fail!) But in the midst of broccoli and chicken breasts I also remember plenty of Slurpies, popcorn, and candy bars. I never heard the words “I can't, I'm on a diet” cross my mother's lips. She was a great example of fueling her body with healthy food while still allowing room for fun foods. 2) You have a diet, you aren't on a diet. My mom never used the word diet to refer to a restricted way of eating. We ate food, and that was that. No guilt. No shame. No justification. Food was food and we ate it. I know a lot of people grow up with a lot of shame around food and feeling bad after eating something and I believe a lot of that is a learned feeling. It is my firm believe that food and guilt should never go together and I learned that because my mom never paired them. 3) Women should lift weights. I sure have a lot to thank my mom for. I am pretty sure without her I wouldn't be doing what I am today. And someday I hope my daughter says the same thing. I want her to understand balance, and moderation and the fact that being strong not only feels amazing but helps you build confidence in other areas of your life. If you want to hear more about my mom, my experience growing up, and how it's shaped what I do today as a female in the fitness industry, I shared a lot more in my interview on the Half-Size Me Podcast here (iTunes) or here (stream on your device). Give it a listen. I am super pumped to share this with you, because I often get question about my powerlifting training and I want to share allllllll the details. 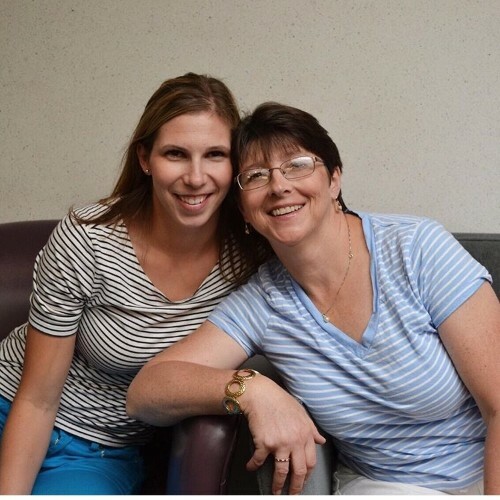 One year ago, my husband and I decided to hire Niki Sims through Starting Strength Online Coaching (SSOC) to coach us with our powerlifting training. We were looking for help with both lifting form and programming. As the weights get heavier and as you move to a more advanced lifter form is incredibly important and programming gets pretty complicated and it was time for us to outsource. We have loved the process and both of us have gotten a lot stronger over the last year and hit a bunch of PR's. We were recently interviewed by Matt and Scott from Barbell Logic Podcast and talked all about our training and progression over the last year. I wanted to invite you to check out our interview. Why and how I made the transition from teaching bodypump to lifting heavy weights on my own. I get it. You’ve reached that point. 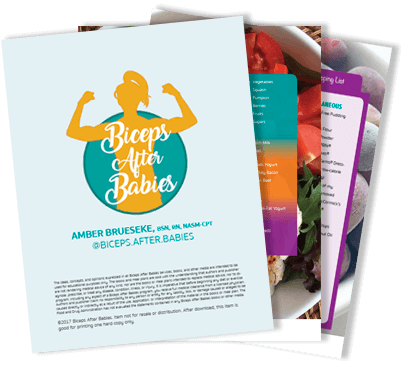 That point where you decide that your fitness journey would be easier with a guide. The point where investing in a coach will help to hold you accountable and allow you to maximize your results in the shortest amount of time. Trouble is, there are a million and one “online fitness coaches” – how is a girl to pick who to hire? As a coach myself with several years’ experience I have some strong opinions about how to make the best decision, but there is one way you absolutely shouldn’t pick your coach. You shouldn’t pick a coach solely based on them having the body or physique you want. You will never look like anyone else. Genetics, length of training, genetics, metabolic differences and, oh yeah, genetics means that you will never look exactly like anyone else. You are you! And even if you train exactly like someone else you aren’t them and your body is going to respond uniquely. How a coach looks has very little bearing on her ability to COACH.I’m all for coaches being able to apply what they are teaching in their own lives, but even more important is her ability to teach, inspire, motivate, and guide – and none of those attributes have to do with her physique. Is this coach smart and well-read both in current health and fitness science but also in psychology and human behaviors? Does this coach want to just tell me what to do or does she want to teach me? Can this coach motivate me in a way that I will respond positively to? Does this coach exhibit personal integrity? What type of accessibility will have to this coach and how responsive will she be to my questions through the process? What is her coaching philosophy? What is she promising? Coaching can be so valuable. Take your time. Find someone who doesn’t just look good, but can actually help you get the results you want. My name is Amber and I am a podcast junkie. It's true. Me + my trusty AirPods + a good podcast = happiness. I like a lot of different programs but I have compiled my all-time favorites in case you are looking for something new to play in your earbuds during your next workout (is it weird that I listen to podcasts while working out?). 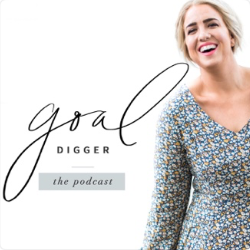 The Goal Digger Podcast by Jenna Kutcher feels like having lunch with a girlfriend. Except this girlfriend is a genius girl boss and gives you all sorts of advice that you don't hear from anyone else. This is a podcast I never miss and I have Jenna to thank for so many ah-ha business moments. I didn't know I was interested in Richard Simmons until listening to this podcast! 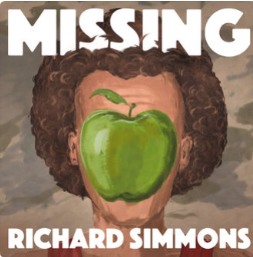 This is a binge-worthy series devoted to exploring the sudden disappearance of Richard Simmons from the public eye. Be prepared for more than a few surprises while listening. 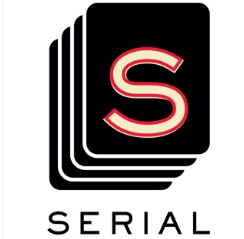 If you are one of 10 people who haven't heard of the podcast Serial you need to go right now and listen to every episode of Season 1. Seriously. Right now. Go. 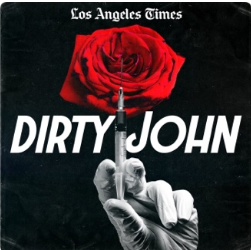 I listened to every episode of Dirty John over a single weekend (it's amazing how much cleaning gets done when you have a podcast in your ears!). It's the real-life story of a woman and her relationship with a fraud-master named John. The story drew me in and definitely made me feel lucky I am happily married to a man who I can trust. I only recently found Online Marketing Made Easy but I have been going through the archives and listening to every single one. 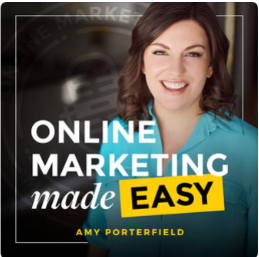 Amy Porterfield is a master marketer and if you have any kind of business her weekly episodes are a can't miss. That's it – those are my top 5 favorite podcasts. 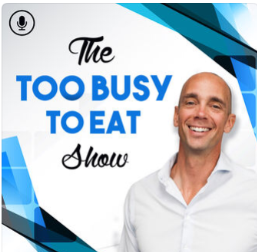 I've tossed around creating a podcast of my own someday, but for now as a little bonus I've included the links to two podcasts that have interviewed me as a guest. 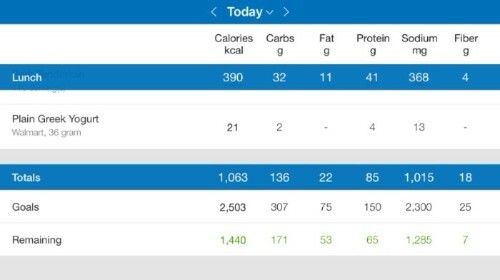 If you are new around here, you might not know much about macros – and that's ok! My goal is to break seemingly complex ideas and lingo down into something anyone can understand. 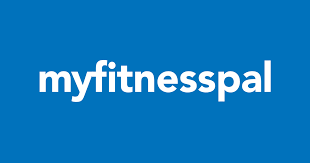 First up – my good friend MyFitnessPal (MFP). This is a free app and if you haven't downloaded it, head to the app store right now and get ‘er done. You back? Ok, good. Now you have one of the handiest tools for tracking your macros downloaded on to your phone. As much as MFP promotes the Premium version, you do not have to purchase it to be able to track your macros. In the future you may want to upgrade (I have) but the free version works just fine for now. One of the biggest mistakes people make at first is not selecting accurate MFP entries. Let me make one thing really clear: not all MFP entries are accurate. For better or for worse MFP allows people to add foods to it's database which means a lot of the foods you search for will be wrong. Don't panic. There is a solution. Tack the term “USDA” to the end of your search. This will bring up foods that were entered off of the US Department of Agriculture meaning they have a much higher chance of being accurate. Use this trick if you are searching for any non-packaged animal or plant product. For example, I would search “skinless chicken breast, raw, USDA” or “fuji apple, USDA” or “baby carrots, USDA.” These entries usually come up with the option to enter your servings in grams which is how you should be weighing all your food. are coming back to the database after each entry you are wasting time! The multi-add feature allows you to add multiple foods from your favorites lists and search results all at once. It really makes logging your food for a meal much faster and easier. 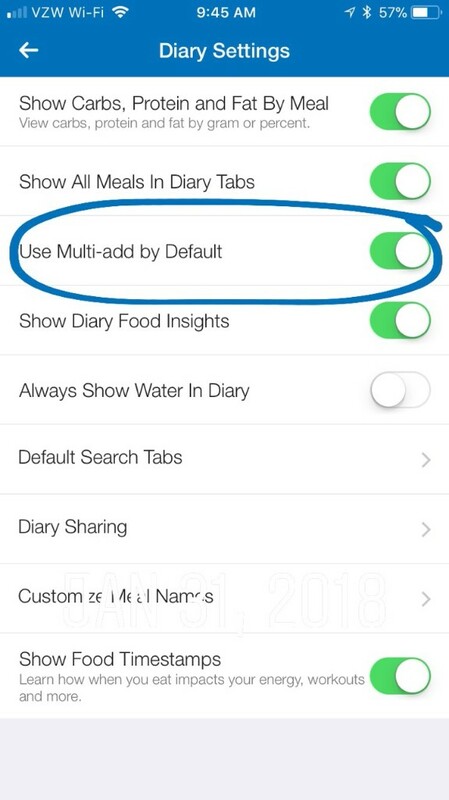 To enter Multi-add mode, go to Settings –> Diary Settings –> and toggle the slider for “use multi-add by default.” Then when searching for foods a filled in bubble will appear next to each food you have added. Mark as many items as you'd like to add, then tap the Add button, and all of the items you've checked will be added to your diary at once. This isn't specifically a MFP tip, but it sure is a helpful one when you want to weigh out food like peanut butter without dirtying 5,000 dishes. When measuring something out of a jar (like peanut butter, pickles, nutella, protein powder), place the whole jar on the scale, zero out the scale, then take the amount out you want. The scale will now display a negative number; forget the negative sign and log that amount in MFP. I have a whole tutorial about how to enter and track a homemade recipe on MFP on my Instagram Story Highlights. That is really helpful for those homemade casseroles and the pancakes you make for your family. But what about those lunches that you make for yourself that aren't really a recipe, but are just some foods that you frequently eat together? For example, maybe you make my Greek Yogurt Chocolate pudding with fruit for snack every afternoon (if you haven't tried it you should – 1 cup of non-fat Greek yogurt + 10 g of sugar-free, fat-free chocolate Jello pudding powder, mix and thin with water to your liking). In this case, saving those foods as a Meal lets you easily add them to your diary as a group. In my example, you could create a Meal called “Chocolate Protein Pudding” consisting of Greek yogurt, pudding powder, and the strawberries you throw on top. You could then add this as a group, instantly, instead of adding each item separately. To create a Meal, just go to the same place you enter food and click the Meals tab. Click “Create a Meal” and enter the components of the meal and save. One of the great benefits to creating a meal rather than a recipe is that when the meal is logged each of the components still shows up individually in your diary. Meaning if you used 120 g of strawberries instead of only 60 g this time making your Protein Pudding you can log the meal and just adjust that one component without having to redo the whole recipe. It still floors me how many people don't know this last really simple game-changing tip. 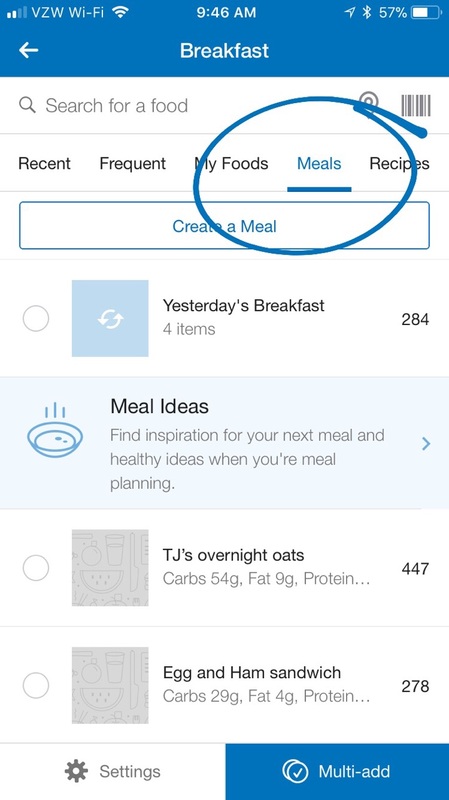 Turn your phone sideways to landscape while viewing your diary in MFP; you'll be able to see the macro breakdown for each meal as well as your total breakdown for the day by scrolling to the bottom of the screen. I sure hope these tips and trick were helpful and that even if you are a seasoned tracker you learned something new! Hit “reply” and tell me which one was new for you or if you have a tip that I missed that everyone should know about! I'm living by these key words this week. Part of me wants to hold this video back and re-do it and get the sound quality better, but you know what? The content is solid. The message is what I want to share. And sometimes you just have to say done is better than perfect. That being said, I hope you enjoy this short (4 minute) video. 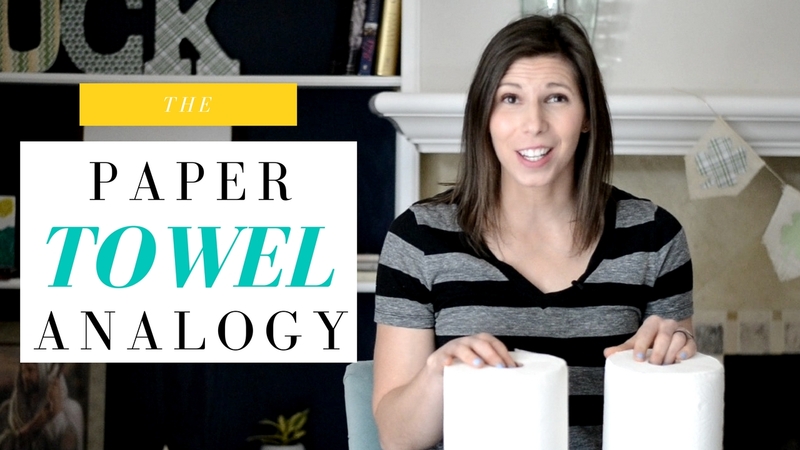 I promise you will never look at a roll of paper towels the same way again! 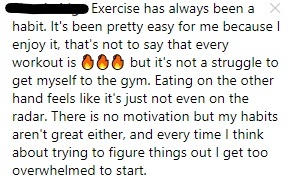 Why is it that so many people who want to lose weight, who know what they need to do to lose weight, struggle to string enough consistency together to gain traction? It is impossible to stay committed and determined to do anything in life unless you nail down your “WHY”. Your “why” is the reason, the driving force behind you wanting to change. If I were to put a ten-inch-wide, thirty-foot-long plank on the ground and say, “If you walk the length of the plank, I'll give you twenty dollars,” would you do it? Of course, it's an easy twenty bucks. But what if I took that same plank and made a roof-top “bridge” between two 100-story buildings? That same twenty dollars for walking the thirty-foot plank no longer looks desirable or even possible, does it? You'd look at me and say, “Not on your life.” However, if your child was on the opposite building and that building was on fire, would you walk the length of the plank to save him? Without question and immediately – you'd do it, twenty dollars or not. Why is it that the first time I asked you to cross that sky-high plank, you said no way, yet, the second time you wouldn't hesitate? The risk and dangers are still the same. What changed? Your WHY changed – your reason for wanting to do it. You see, when the reason is big enough, you will be willing to perform almost any how. I want you to do some soul searching this week and get serious in thinking about what goals you have for yourself and why you want to accomplish them. Once you get to the root of your “why”, it changes the game. Here is your challenge for today. Write your why down. Put it on your mirror. Read it every night. Make your why something you can recite to yourself when choices get hard or temptation crops up. There was a great discussion in the comments and also in my stories about how to form habits and how long that process takes. Many of you said that while you feel like you have made exercise a habit, finding the same success with your diet is much harder. I hear you! I've found that exercise habits are often quicker to master than eating habits – but it does happen over time! 1) Know your WHY. There is a reason you want to change your body or your eating habits. Get really crystal clear on what that is. Why are you doing this? If your why is important enough you will find a way to accomplish it. 2) Try something new. Attend a new group fitness class. Search for new recipes on Pinterest. Implement a new morning routine. Switching things up you can breath new life into your health and fitness routine and resurrect those feeling of novelty that you experienced at the beginning of your journey. 3) Create a vision board Create a board with inspirational sayings, pump-you-up words, and photos that depict what you are working towards. If you don't want to create an entire board change your phone lockscreen to display your goal or a motivational saying. Keeping your goal front and center helps to re-invigorate you when things get hard. 4) Be grateful. Don't compare yourself to others. I know, I KNOW this is hard. Especially in this age of social media. Go through your social media accounts right now and unfollow or unfriend anyone who causes you to slip into the comparison game. Be grateful for your body, your family, your friends, and any progress you have already made. 5) Reward yourself. Set small milestone along the way and plan a reward when you hit those milestones. 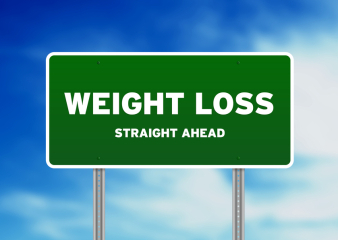 Lose 5 lbs? Get a pedicure. String a week of consecutive tracking together? Time for a new sports bra. Setting small goals with rewards can help the process to feel like several sprints rather than a marathon.